In 1958, five years after Watson and Crick discovered the molecular structure of deoxyribonucleic acid (DNA)—the double helix—Crick proposed the central dogma of molecular biology, and this he popularized in a paper in Nature in 1970. In its basic terms, the central dogma states that genetic information flows in only one direction from DNA (“transcription”) to RNA (“translation”) to proteins. Information is “transcribed” from a section of DNA to a newly assembled piece of messenger RNA (mRNA); mRNA makes a copy of one of the two strands of DNA, which serves as a template. 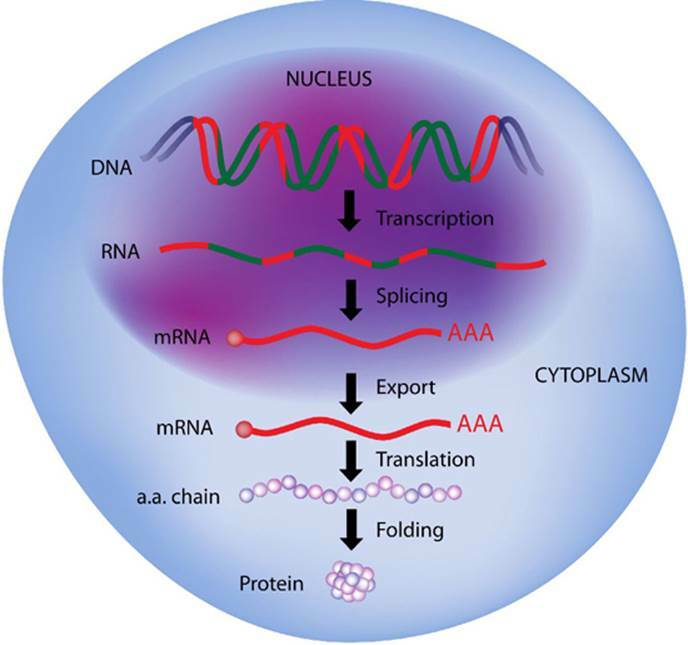 The mRNA then travels from the nucleus to the cytoplasm where it binds to a ribosome. The ribosome translates the instructions as a codon, a three nucleotide sequence that spells out the order in which amino acids are to be added to the growing peptide chain. The final step involves the faithful replication of DNA to a daughter cell, carried out by the process of mitosis. As originally formulated, the sequence was never translated backwards from DNA to RNA. When the enzyme reverse transcriptase was independently discovered in 1970 by Howard Temin at the University of Wisconsin-Madison and David Baltimore at MIT, this upset the premise of the central dogma. For this work, Temin and Baltimore were co-recipients of the 1975 Nobel Prize. Subsequently, it was found that reverse transcriptase is present in retroviruses, such as the human immunodeficiency virus (HIV), and converts DNA from RNA. In addition, and as another exception to the central dogma, not all DNA is involved in programming the synthesis of proteins. Some 98 percent of human DNA is noncoding DNA (dubbed “junk DNA”); its biological function has not yet been determined. Semantic issues were also raised. In his 1988 autobiography, What Mad Pursuit: A Personal View of Scientific Discovery, Crick commented that the term “dogma” was ill-advised. He chose not to use the word “hypothesis,” which, in retrospect, would have been far more appropriate. Dogma is a belief that cannot be doubted—certainly not the case when used here. SEE ALSO: Deoxyribonucleic Acid (DNA) (1869), Mitosis (1882), The Double Helix (1953). This image depicts the flow of genetic instructions from DNA, to RNA, to the production of amino acids, which link together to form proteins.